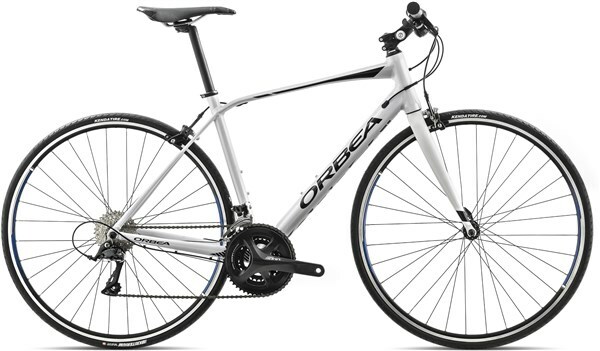 The Orbea Avant H50 Flatbar is a sportive bike that gives easy riding over longer distances. The alloy frame is made using hydroforming, manipulating the frames to add and remove material in certain areas, optimising the strength and weight to deliver a fantastic ride. The Shimano Sora drivetrain deliver super smooth road style shifting, and a wide range of gears to take on long and short distances alike. Get commuting or training on the Orbea Avant H50 Flatbar road bike. Dynamic Structure Comfort - Structure, tubing shapes and frame design are elemental to building a comfortable frame that helps reduce muscle fatigue. Avant's Dynamic Structure provides a smooth, light ride without bulky compromises like tubing inserts and elastomers. The natural flex patterns created by the carbon layup and minimal bulk of the top tube and seat stays deliver a dynamic, smooth ride that feels like floating over rough roads. The sensation is subtle - but it is noticeable and can be tested. Efficiency - The large majority of torsional and lateral loads are handled by the lower spine of the frame. The headtube, downtube and chainstays are shaped to resist twisting and transmit power to the rear wheel. There is no doubt about it, large cross-sections and resistance to flex in the bottom of the frame translate directly to more watts on the road and a sensation that power transfer is instantaneous. Avant Fork - The Avant fork uses a shallower, rounded-blade profile and longer fork legs to offer the best combination of elasticity, tire clearance and torsional stiffness. The increased axle-to-crown height is offset by a shorter headtube to maintain stack measurements and improve aesthetics. Orbea Endurance Geometry - Avant Endurance Geometry is born from years of analyzing how ergonomics can help you ride further. Unlike a racing geometry that is focused on aerodynamics, endurance ergonomics result in a bike that is easier to ride and increases stamina. Handling is precise and intuitive. Angles and dimensions are considered carefully across a range of sizes to maximize rider comfort. And more comfort means longer rides. Frame: Orbea Avant Hydro, hydroformed triple butted aluminum, headset 1-1/8", BB 68mm - BSC English , internal cable routing, 130 OLD, 27,2mm seat tube. Fork: Avant carbon fork, aluminum steerer, 1-1/8" head tube.